Attorney General Bill Schuette’s office has filed court papers asking the Michigan Supreme Court to throw out a ballot measure that, if approved, would change how Michigan draws legislative districts. In the friend-of-the-court brief, Schuette and state Solicitor General Aaron Lindstrom argue that the redistricting proposal, put forward by group Voters Not Politicians, would create “a fourth branch of government” in Michigan by creating an independent commission to draw political boundaries, replacing the current system which is controlled by the Legislature. Such a commission, Schuette’s office wrote, would improperly exercise “legislative, executive, and judicial powers” and not be subject to a system of checks and balances. Citizens Protecting Michigan’s Constitution, the group opposing the redistricting proposal, has asked the Supreme Court to throw out the ballot measure, arguing that it would too broadly change the state constitution. Such broad changes can only be enacted through a state constitutional convention, not through a ballot measure, the group argues. Schuette’s court brief, filed late Friday, joins Citizens’ cause, though it offers an additional legal argument. “This issue, which has the potential to fundamentally change the structure of our government, is an issue of great public importance and warrants this Court’s review,” the Attorney General’s Office wrote. A state board approved the proposal for the November general election ballot last week, after a Michigan appeals court rejected a challenge to the redistricting measure in early June. Opponents are asking the state’s high court to reverse the appeals ruling. The Supreme Court has not yet decided whether to hear the issue. 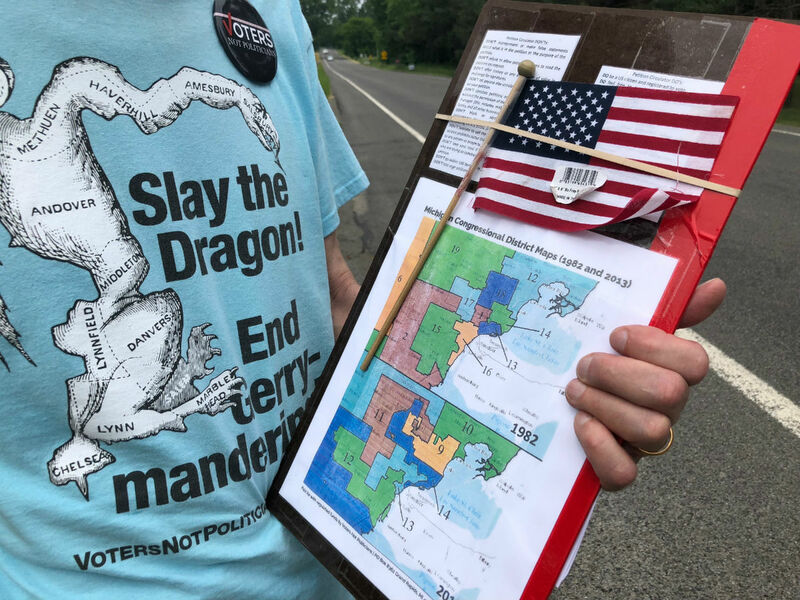 The case is rich with political intrigue, with Democrats in Michigan generally backing redistricting reform and Republicans (who currently control the state House, Senate and governor’s office) generally opposing the measure. Schuette, the attorney general, is also the frontrunner in the Republican Party primary race for governor. His brief was filed in a court in which Republican-backed justices form a majority. Schuette’s filing argues that the commission outlined in the 1963 state Constitution was invalidated in 1982 “under federal equal-protection case law” putting redistricting power went back into the hands of legislators. Long also said there are plenty of institutions within state governments — including the Attorney General’s office — that take on the powers of several branches of government. The Attorney General’s office did not immediately return Bridge’s request for comment Tuesday. The Supreme Court has until September 7 to issue a ruling, but has several options for how to proceed. Fahey told reporters last week she expects to hear from the court by mid-to-late July. Schuette and three other Republicans running for governor — Lt. Gov. Brian Calley, Sen. Patrick Colbeck and obstetrician Jim Hines — have said they would not vote for the proposal if it remains on the ballot come November. They join other Republican leaders such as Senate Majority Leader Arlan Meekhof and House Speaker Tom Leonard in opposing the initiative. All three Democratic candidates for Governor — former Senate Minority Leader Gretchen Whitmer, former Detroit Health Director Abdul El-Sayed and businessman Shri Thanedar — have voiced support for it. Voters Not Politicians spokespeople have consistently said the group is nonpartisan and is supported by voters across the political spectrum. No big surprise. I would want to defend my unfair advantage too. I believe Gerrymandering is the cause of the loss of civility across our nation. Both sides of the aisle see no need to compromise. One because it knows it will never get a say and the other because they control the agenda without a mechanism for the people to hold them accountable. The only way for the electorate to get ther wishes heard is to elect more aggressive and less amiable people to fill their seats. Civility will only happen when it is necessary for both parties to coexist. This ride has just begun... buckle up! Schuette objects to the creation of a "fourth branch of government". It's called "the voters", Bill. They're who you are trying to stop, but they should have the right to step in when the other three branches fail to represent their interests. No surprise here. Bill Schuette has put his own interests and those of his political party over the interests of the citizens of Michigan time and time again. That is, unless you're a citizen who happens to be a GOP donor with lots of money, then he's got your back. Sorry, Bill, it IS voters, not (partisan) politicians. We have ceded too much of our political process to two political parties rather than to the individuals that make up our communities. Bill, you and your ilk should spend more energy on serving Michiganders rather than preserving your party's hold on power. Well Bill, You der Champion of the Not Citizens Rights, this is just another reason why the Republicans need to lose their death grip on denying due process to those who require it but are now denied it by Republicans. If the Michigan Supreme Court has any sense of reason they won't blatantly deny the people who deserve the right to have fair representation. Schuette's wrong about this commission would create a fourth branch of government. The Republicans have already created a fourth branch that directs and creates policies and laws....the DeVos family. When you want to pick your voters rather than earn a voters' trust, this is what you do. Dana Nessel will serve ALL of Michigan when she's elected AG, not just the GOP. Not unexpected. Schuette has always jumped in on the side of special interests when they oppose the electorate. And this man wants to be governor of the people of Michigan! Well of COURSE he doesn't want the PEOPLE to have a say in how things are run ... he never does! Republicans can't win unless they cheat, so of course Bill Schuette is doing everything he can to keep the ability to cheat on the table. Before everyone jumps all over me, let me say that I oppose gerrymandering. I also oppose the formation of a commission to draw boundaries. Yes, the commission is supposed to be non-partisan and the make up of the commission with equal Dems and Repubs is meant to sound non-partisan, but who picks the independent members of the commission? There is no such thing as a non-partisan person. Everyone has feelings that will put them in one camp or another. Sort of like a SCOTUS nominee going before the Senate. The person says one thing, but everyone knows how that person will vote. A better way would be to use a formula to draw the districts. Engineers use the concept of a center of gravity of a mass. The census lists the zip code and the population all over Michigan. Apply the concept, and one could arrive at nearly rectangular equal population districts for the entire state. I could support a formula. It would not depend on who was in power to pick commission members, and a formula is totally blind when it come to looking at political parties. Plus the formula would endure forever, and not be changed by the makeup of a commission changing over the years. This is a really interesting concept! But I'm wondering if it might be too difficult a formula to create. Center of mass is the point at which the distribution of mass (people?) is equal in all directions. That could be easy. The hard part (maybe) is establishing a center of gravity for the varied interests of the population. Center of gravity is the point at which the distribution of weight is equal in all directions - I see "weight" as (among probably dozens of other defining factors) urban/rural; Dems/GOP/Independents; average income; etc. But you're right - if we could achieve redistricting mathematically, that could be a big step forward! The proposed commission consists of 13 members: four each from the two largest political parties and 5 unaffiliated with the two largest parties. Individuals must apply to be considered for the commission, state their party preference (if any) in the application and chosen randomly by the Secretary of State. The proposal doesn't specify a criteria for redistricting, that's to be decided by the commission and the proceedings are mandated to be published and open to the public. If center of gravity of mass is a viable choice, there's nothing stopping the commission from choosing this method. What do you mean "theres nothing stopping the commission from choosing this method"??? The commission is not an elected branch of our government, therefore would have no right to do anything other than what the new law would grant them. The only pro-proposal 2 signs I see, are mixed among democrat candidate yard signs. The only people knocking on my door are democrats asking me to vote yes on Proposal 2. Democrats know full well, independents are 95% liberal and would go along with all democrat redistricting. Talk about Gerrymandering. Prop 2 is the definition of the word. I noticed your story says "Democrats generally support" the VNP redistricting proposal and "Republicans generally oppose" it. Have you surveyed the general public to learn this? I think you're describing Republican and Democrat POLITICIANS and their preferences -- and they hardly represent the voice of the people. Republicans, Democrats and independents all signed petitions to get this proposal on the ballot. While Voters Not Politicians and the Democratic Party keep asserting that Michigan is "highly gerrymandered", that is true only in the sense of the new "wasted votes" statistical metrics. Based on the long-standing standard that calls for "compact and contiguous" districts and the often-contradictory requirements of the Voting Rights Act for a certain minimum number of "majority minority" districts, Michigan has an admirably balanced electoral map. Outside the Detroit-Pontiac-Flint-Saginaw axis on the south-east side of the state, Michigan's voting districts are almost completely aligned with city, township or county borders. However, a total of 4 majority-minority districts were required based on 2010's census data about overall population, African-American population, and the Voting Rights Act . The fact that Democrats tend to prefer to live in urban areas, and that most African Americans lean Democratic, making urban districts with a majority of African-American voters very highly Democratic, is not evidence of gerrymandering, but of self-selection of residences on the part of the voters. Michigan voters, not the legislature, should have a voice in redistricting our state FAIRLY. For far too long, we've had a "no nothing" legislature that cast aside voters' preferences in favor of its big donors' agendas! Of course Democrats support it. The commission would be made up of 4 republicans, 4 democrats, and 5 independents. 95% of the time, Independents are liberal democrats. So if proposal 2 is voted into law, the Democrats will be gerrymandering the districts, the very thing they accuse the legislators of doing. And they know it, they are just too dishonest to say so.